Sometimes we find very difficult to check the status of any flights, We do call to customer care to check when flight departed and when it will arrive at destination airport. But we do not know that multiple websites/airlines are providing real time flight tracking. We can easily track the status of International and domestic flights online. For international flights multiple outside airlines are already providing the features but for domestic flights this is new service and most of the airlines from the domestic list like- Indigo, Go Air, Indian Airlines, SpiceJet, Jet Airways , Air India,Vistara, Air Asia had started the service. We can track the flight status online by either visiting the respective airline website or we can track the same through some third party websites that are already providing the service on common platform. 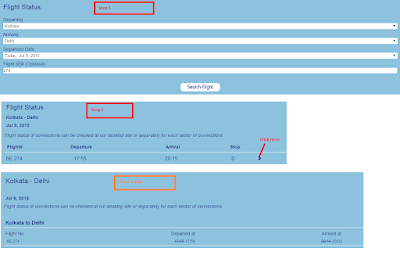 Step 2 - Click on "Flight Status " button and enter Departing/Starting airport and dates to get the status.